A business lesson learned from the NC State vs. Clemson basketball game–you can’t make ’em all. My friend and I went out to lunch the other day, where we sat and talked as we waited for our food to arrive. And waited and waited. Seems the establishment we had chosen was having a slow day. Whatever. We made the most of it, talking about business and sports. Yeah, we do that a lot. We also watched a basketball game, Clemson vs. NC State. Clemson seemed to be making every shot they took, while NC State couldn’t make any. Not surprisingly, before long, Clemson had built an 18-point lead. My friend predicted that Clemson would win. I could see why. But the thing about sports predictions is they often don’t play out. If you think you know what is going to happen, you’re probably wrong. I’m no different. But on that day, I risked a prediction. I said NC State would win. After all, very few teams can keep up dominant play for an entire game, it gets tiring. Also, at least part of that 18-point lead had to be luck. Normally I’m not a fan of attributing things to luck, but that’s because I see people using the word “luck” to imply talented people aren’t really talented. I’m not into that. But let’s face it, none of us can control everything. Luck, or at least the laws of chance, are a part of it. And chances are against anybody being that lucky—or that unlucky—forever. Well, as I said, I was just making conversation. Our food finally showed up. We ate, and we left. Had to get back to the office, after all. We didn’t watch the rest of the game. Later in the afternoon I was curious, so I looked up the score. You’ll never guess who won. Part of it was a blown call by an official (a story for another day—maybe a lot of stories), but part of it was exactly what I had predicted: Clemson started missing, and NC State started making. The law of averages is real. You can’t be lucky—or unlucky—forever. Sooner or later, the pendulum will swing the other way. It won’t necessarily happen in the same game, which is why I can’t make my living at sports betting, but that’s because games are relatively short. Given enough time, enough games, and you’ll see the pattern. Business, sales specifically, is the same. 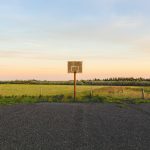 Sure, preparation, timing, connections, knowledge, demeanor, emotional intelligence, and many other characteristics all play a role, but then there is always the element of chance; at any level, if you keep shooting, you will eventually miss. And if you keep missing, you will eventually make it. I tell myself and my team this all the time. And while you’re shooting, be sure to listen to our podcast on Apple or our website. Image of Clemson vs. NC State was taken by Lauren Nelson under the Creative Commons Attribution 2.0 License.